The House Order of Hohenzollern (German: Hausorden von Hohenzollern or Hohenzollernscher Hausorden) was a dynastic order of knighthood of the House of Hohenzollern awarded to military commissioned officers and civilians of comparable status. Associated with the various versions of the order were crosses and medals which could be awarded to lower-ranking soldiers and civilians. 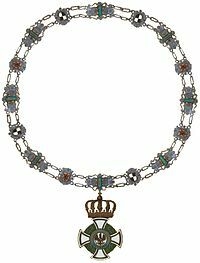 The House Order of Hohenzollern was instituted on December 5, 1841, by joint decree of Prince Konstantin of Hohenzollern-Hechingen and Prince Karl Anton of Hohenzollern-Sigmaringen. These two principalities in southern Germany were Catholic collateral lines of the House of Hohenzollern, cousins to the Protestant ruling house of Prussia. On August 23, 1851, after the two principalities had been annexed by Prussia, the order was adopted by the Prussian branch of the house. Also, although the two principalities had become an administrative region of the Prussian kingdom, the princely lines continued to award the order as a house order. The Prussian version was then known as the Royal House Order of Hohenzollern (Königlicher Hausorden von Hohenzollern or Königlich Hohenzollernscher Hausorden), to distinguish it from the Princely House Order of Hohenzollern (Fürstlicher Hausorden von Hohenzollern or Fürstlich Hohenzollernscher Hausorden). Although Kaiser Wilhelm II abdicated in 1918 as German Emperor and King of Prussia, he did not relinquish his role as Head of the Royal House and as such he was still able to confer the Royal House Order. The Princely House Order continued to be awarded, unofficially, after the fall of the German Monarchy. Another development occurred in 1935. Prince Karl Anton's second son, Karl Eitel Friedrich of Hohenzollern-Sigmaringen, had become prince and then king of Romania as Carol I. Carol I had died childless and was succeeded by his nephew Ferdinand I, also of Hohenzollern-Sigmaringen. During the reign of Ferdinand's son King Carol II, the Romanian government established its own version of the House Order of Hohenzollern, known in Romanian as Ordinul "Bene Merenti" al Casei Domnitoare ("Order of 'Bene Merenti' of the Ruling House"). This form of the order existed until the Romanian monarchy was abolished in 1947; King Michael also awarded a slightly altered order in exile. "Member" was a lesser class for soldiers who were not officers, as well as civilians. The Members' Cross (Kreuz der Inhaber), especially with swords, was a rare distinction for non-commissioned officers and the like. Another decoration, the Members' Eagle (Adler der Inhaber) was often given as a long-service award to lesser officials such as schoolteachers. The "Eagles" (the Members' Eagle and the Knights' Eagle, or Adler der Ritter) were solely civilian awards, and could not be awarded with swords. All other grades could be awarded with swords. 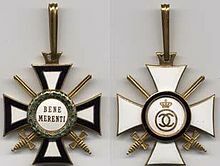 During World War I, the Knight's Cross with Swords of the Royal House Order of Hohenzollern became in effect an intermediate award between the Iron Cross 1st Class and the Pour le Mérite for Prussian junior officers. When awarded with swords it was worn on the ribbon of the Iron Cross. The Crosses of Merit, Golden Medal of Honour and Silver Medal of Merit were lesser grades for non-commissioned officers, enlisted men and their civilian equivalents. All grades could be awarded with swords. During World War I, the appropriate grade of the Princely House Order was often awarded to officers and men of Füsilier-Regiment Fürst Karl Anton von Hohenzollern (Hohenzollernsches) Nr. 40, an infantry regiment raised in the principalities of Hohenzollern and whose honorary chief was the Prince of Hohenzollern. Soldier in the regiment's sister reserve and Landwehr regiments also often received the decoration. Unlike the Royal House Order, awards of the Princely House Order were made on the standard ribbon of the order (the "statute" ribbon) regardless of whether they were with or without swords. The classes of the Romanian version of the House Order were essentially the same as those of the Princely House Order, except that the Cross of Honour 3rd Class of the Romanian version could be awarded with Oak leaves, and the Golden and Silver Medals could be awarded with a Crown. As with the Prussian and Hohenzollern versions, crossed swords could be used to indicate a wartime or combat award. Given the short existence of the order and the fact that Romania had a number of other decorations for valor and military merit (Order of Michael the Brave, Order of the Star of Romania, Order of the Crown of Romania, Air Force Bravery Order, Cross of Military Virtue, Air Force and Naval Bravery Crosses, Crosses and Medals for Faithful Service, Medals for Steadfastness and Loyalty), awards of the Romanian version of the House Order with swords are uncommon. The badge of the House Order of Hohenzollern was a cross pattée with convex edges and curved arms (sometimes called an "Alisee" cross). There were differences in the enameling of the arms of the cross for the Royal, Princely and Romanian versions, but all featured white enamel on the higher classes and a black enameled stripe near the sides of the cross. Between the arms of the cross was a wreath of laurel leaves (left side) and oak leaves (right side). The white-enameled medallion of the Royal House Order of Hohenzollern bore a black Prussian royal eagle with the Hohenzollern house coat of arms on a shield on the eagle's chest. Around the center medallion, a gold-rimmed band of blue enamel bore the motto in gold letters: vom Fels zum Meer ("From the cliffs to the sea"), with a wreath of laurel below. The white-enameled medallion on the reverse bore the cipher of King Frederick William IV of Prussia, the king when the order was founded. A gold-rimmed band of blue enamel bore the date den 18. Januar 1851 with a wreath of laurel leaves (left side) and oak leaves (right side). The white-enameled medallion of the Princely House Order of Hohenzollern bore the Hohenzollern coat of arms (a quartered shield of black and white) under a princely crown. Around the center medallion, a gold-rimmed band of blue enamel bore the motto in gold letters: für Treue und Verdienst ("For loyalty and merit") with a smaller wreath of oak leaves below. On most grades, the white-enameled medallion on the reverse bore the intertwined ciphers ("F" and "A") of Princes Friedrich (Konstantin's actual first name) and Anton, the princes who founded the order, under a princely crown. The gold-rimmed band of blue enamel bore one of several dates, depending on the class, such as den 5T April 1844 for the 2nd and 3rd Classes, with a wreath of laurel leaves below. The white-enameled medallion of the Romanian House Order bore a black Romanian eagle with the Hohenzollern coat of arms on a shield on the eagle's chest. Around the center medallion, a gold-rimmed band of blue enamel bore the motto in gold letters: nihil sine Deo ("Nothing without God"). The white-enameled medallion on the reverse bore the crowned cipher of King Carol. The gold-rimmed band of blue enamel bore the date of the founding of the Romanian kingdom, 10 Februarie 1881. The statute ribbon of the order was white with three black stripes (with slight variations among the Royal, Princely and Romanian versions). The following list is only a sample of some of the more prominent recipients' names. As noted above, the Knight's Cross with Swords of the Royal House Order was the intermediate decoration between the Iron Cross 1st Class and the Pour le Mérite for Prussian junior officers. There were over 8,000 awards during World War I of this class (there were far fewer awards of the other classes, or of any class before the war). Thus, among the ranks of Imperial German Army junior officers who earned the Royal House Order as lieutenants, captains or majors in World War I are several hundred who reached the rank of general the Wehrmacht in World War II. Leonhard Graf von Blumenthal – Prussian Field Marshal of the Wars of Unification; held the Royal House Order Grand Commander with Swords on Ring and Commander with Star with Swords; also received the Pour le Mérite with Oak leaves and Diamonds. Oswald Boelcke – One of Germany's top aces of World War I; also received the Pour le Mérite. Karl Dönitz – Later a Grand Admiral in the Kriegsmarine and briefly successor to Hitler as leader of Germany. Werner Albrecht Freiherr von und zu Gilsa was a German officer and General of Infantry, whose last assignment was as Wehrmacht commandant of Dresden. In 1936, while a lieutenant colonel, Gilsa became commandant of the Olympic Village, during the Berlin Olympic Games of summer 1936, after the demotion of Wolfgang Fürstner. Ernst Jünger – Later awarded the Pour le Mérite. Author of a famous memoir of World War I, Storm of Steel. During World War II, he rejoined the Wehrmacht as a captain and served in the occupation forces in Paris.